Oslo Bar Galway. Great Spot For Lunch and Craft Beer. And a distillery up the stairs! And a distillery up the stairs! 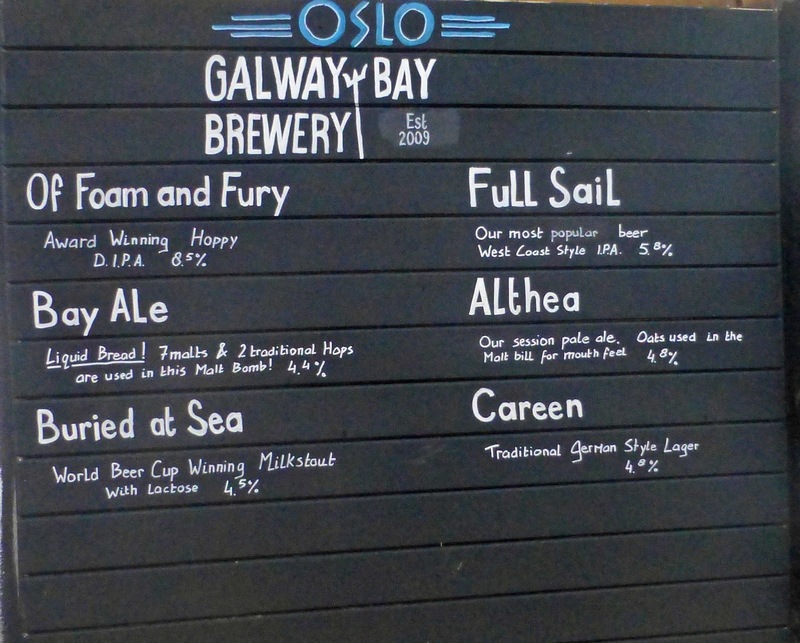 Galway Bay has just moved its brewery from “mothership” Oslo Bar in Salthill to Ballybrit. But fear not: the bar is still serving up the iconic Galway Bay brews such as Full Sail, Bay Ale, Stormy Port, Buried at Sea, Of Foam and Fury, and Althea as we found out this week when we visited for lunch and a tour of the Micil Distillery that has replaced the brewery at the rear of the premises. The well positioned bar serves food, lunch and evening meals, every day of the week, mainly in the front half. The rear is more like a beer hall with a huge screen, apparently the biggest in Galway, where all kinds of sporting events are shown. Upstairs and to the rear is where you will find the Micil Distillery, producing Poitín and Gin and about to lay down their first whiskey. After a two and half hour trip from Cork we were ready for grub when we arrived in Salthill. Parked up near the aquarium and headed around the corner to Oslo. A big warm welcome and soon we had the lunch menu in our hands. As you might expect, there are a few burgers on the menu, also fish and chips. There is also a Spinach and Sweet Potato Salad, Beer Braised Beef Cheeks, and a kale Superfood Salad. With a big dinner booked for the evening, we didn’t want anything major so settled for the sandwich menu. There was a Goats Cheese and Chorizo offer with all the trimmings (including chips) for €8.50. 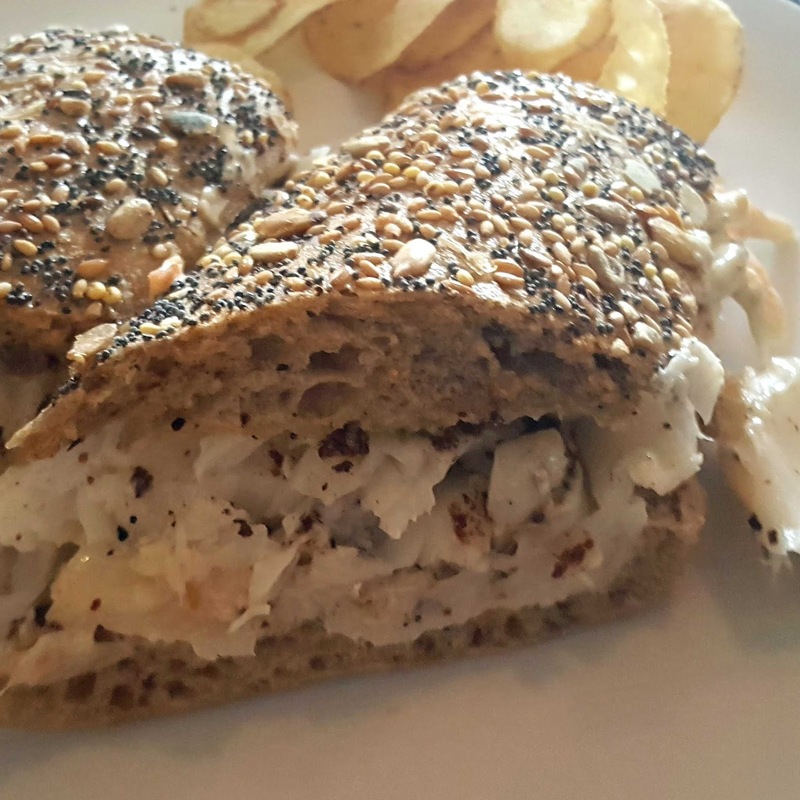 But I picked the Grilled Cod Sandwich (with creamy slaw and tartar sauce on a multiseed ciabatta). Excellent. Fish tasted as fresh as could be and good value for €9.50. CL’s Black Wrap came in at a euro less and was also well worth it. This Spinach infused tortilla with black beans, avocado, sweetcorn, black olives, leaves, salsa, and coriander with chipotle and lime yoghurt was packed with great flavour and texture. Other sandwiches on offer included Cajun Chicken and Chorizo, Baked Ham and Smoked Gubbeen, Fried Chicken Wrap. After that and a chat or two with the friendly and helpful staff we were good and ready for our tour of the Micil Distillery. Staying overnight? 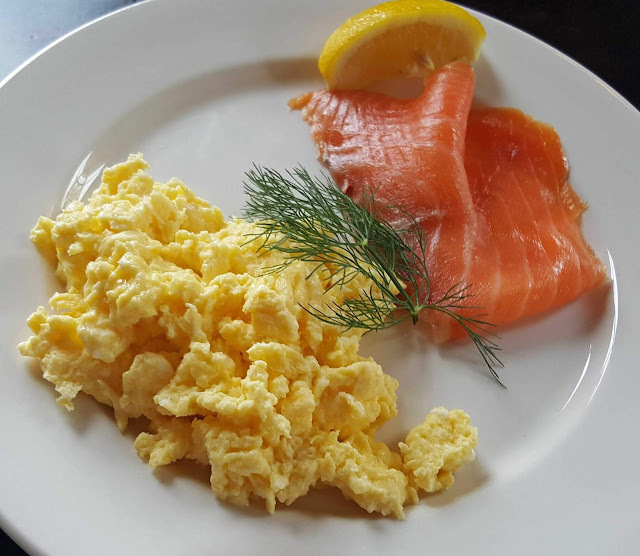 Why not try the Nox Hotel who have a great offer for January? * We’ll have to ORSO by night sometime and get stuck into that amazing beer list. É a ioc, é a ól, é a iompar. 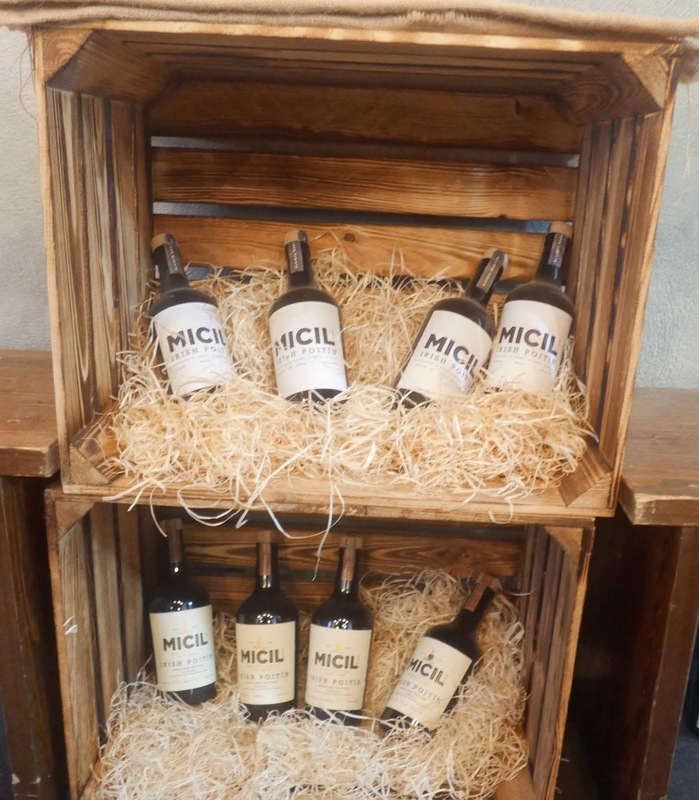 Spirits from the Bog by Micil Distillery. É a ioc, é a ól, é a iompar. 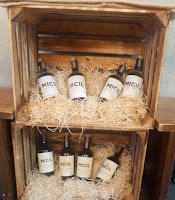 Spirits from the Bog by Galway’s Micil Distillery. You can take Poitín out of the bog but you can’t take the bog out of Poitín. During Tuesday’s very interesting tour of the Micil Distillery, upstairs at the Oslo Bar in Galway’s Salthill, Pádraic Ó Griallais told us that Bogbean has long been associated with Poitín and they use it as a botanical in their smooth and delicious Micil. Their gin is worth checking out too! The distillery and its products - there will be a whiskey in the future - are named after Pádraic’s grandfather Micil, a legend of the bog and its Poitín. Micil is ninety one now and still enjoys a bottle of the spirit every week, shared of course! Later, Pádraic told us a yarns about Micil. We’ll call this Tús a Phota, the first of the pot. Tradition deigned that the first drop from the pot (still) would be set aside for the “others”. These others were vaguely defined, might be the little folk, maybe dead relatives. 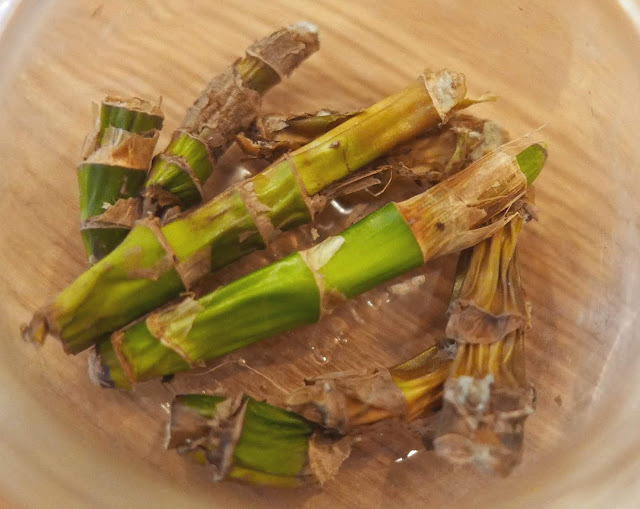 So normally, while operating in the middle of the bog, that first sup was left in a little container at the edge of the operation (illicit) and, normally, was never touched. But then, one night, the first offering was taken, behind Micil’s back. And so was the second. The third though was still intact as dawn broke. In the near distance, Micil saw a human form lying on the turf. Turned out to be a neighbour who had emptied the two jugs but couldn’t take the high alcohol and fell asleep before he could make good his escape. Micil had over time "distilled" the three prerequisites of drinking: é a ioc, é a ól, é a iompar. That the drinker should be able to pay for it, able to drink it and able to hold it. The native language here at its most precise. The Mac Chearra family trace their association with distilling back to 1848, to another Micil, Pádraic's great-great-great grandfather. Pádraic is the sixth generation and has many tales to tell, including escapades involving the Royal Irish Constabulary and the Garda Síochána. 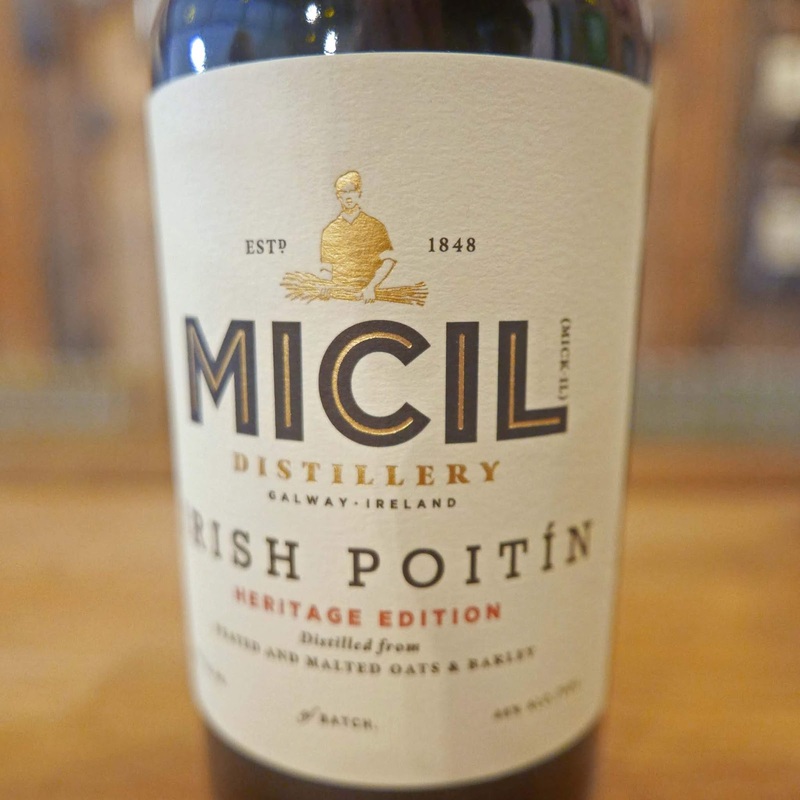 Poitín has been legal since the late 20th century and, in 2008, Irish Poitín was accorded (GI) Geographical Indicative Status by the EU. 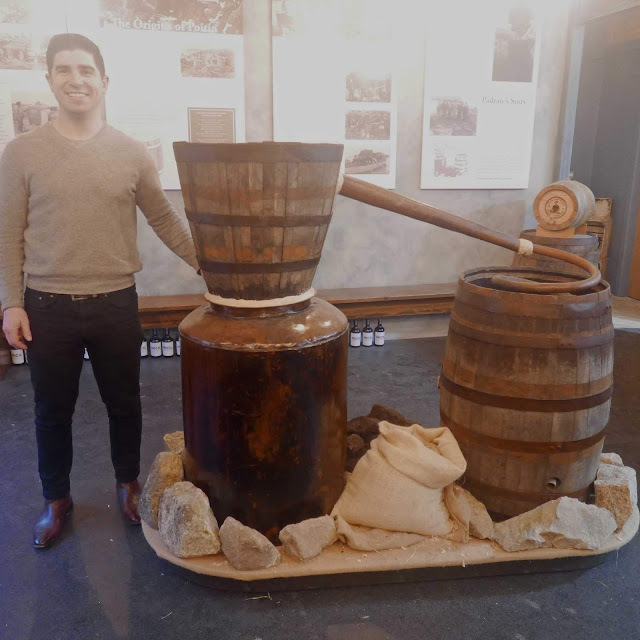 One generation after another of Padraic’s ancestors made Poitín, illicitly! He himself doesn’t admit to anything illegal of course but does say he picked up a lot from his grandfather. 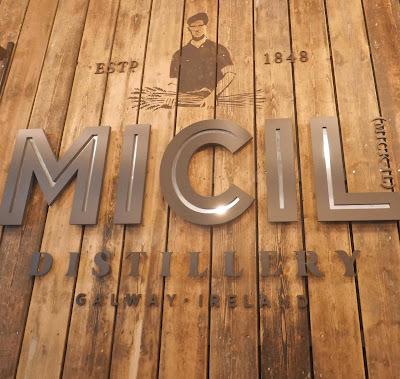 By the way, Micil is the first distillery in Galway since Percy’s, whiskey producers, who last operated in 1911. Pádraic dispelled the theory that Poitín is made from the potato. Theirs, like most, is made from grain and comes in a dark bottle (like much alcohol in the good old days, it was for “medicinal purposes”!). We’d been talking but also tasting, neat first, and then with ginger beer (Fever-tree) in Micil’s take on the Moscow Mule. It is amazingly smooth, much more of a body than you’d get with vodka. By the way, I’d prefer to sip the Micil on its own rather than with the ginger beer. The again, if I had all day, I might have found a happy medium! Then Pádraic produced another Poitín, their Heritage Edition, the only one hundred per cent Irish peated spirit, 80% barley and 20% oats. It is quite viscous, he pointed out, the legs slow to clear, the only spirit using peated oats in the country. The nose is earthy, spicy, lightly smoky. Much the same on the palate, the peatiness there too but not at all dominant. “Very akin to a single malt,” he said, “Very approachable.” We agreed. Do look out for this exceptional drink. And now we were on to their Micil Gin, a complex gin. 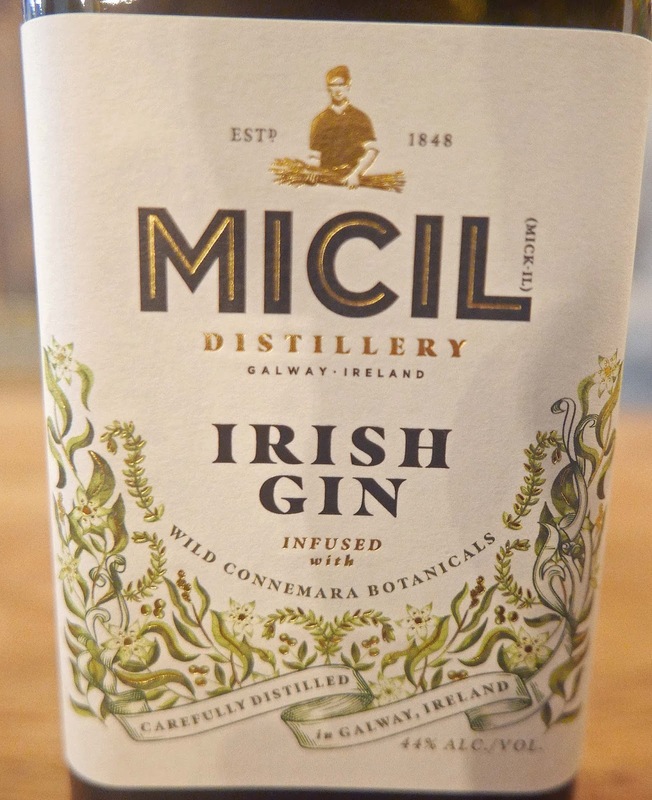 It does have the essential juniper but this is “very West of Ireland” and contains local botanicals such as heather flowers, bogbean, hawthorn berry and bog myrtle (used in previous times instead of hops). Juniper, of course, is used and other more traditional botanicals include Coriander (for its citrus), Orris Root Power and Angelica Root Powder (both for their fixative properties), orange peel, lemon peel, caraway seed, cardamon, elderflower and elderberry. 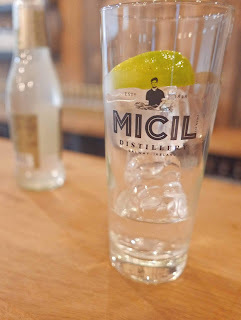 The final result means that Micil is somewhat sweeter than London Dry Gin. It is an excellent gin. You don’t need too much else in the glass with this one. “Micil does the talking itself,” says a rightly proud Pádraic. The distillery is a relatively new adventure. Indeed, up to recently, its space was the place where all the fabulous Galway Bay beers were being produced. 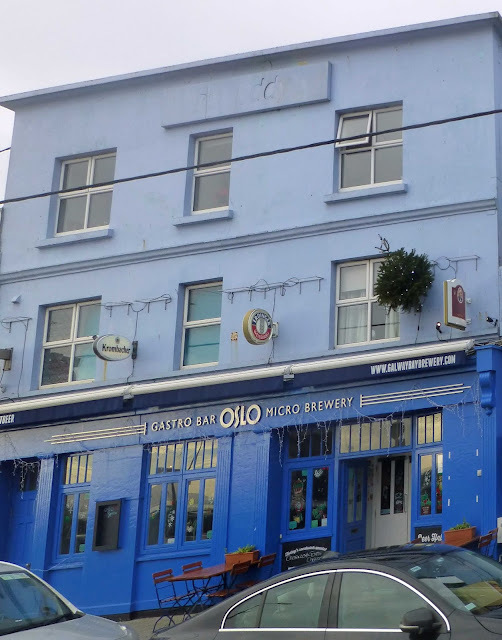 Now Galway Bay Brewery have moved to another location in the city and Poitín and gin have moved in and, as he wrapped up the weekly bottle for Micil himself, Pádraic said whiskey will soon make it a trio of divine, if not holy, spirits. Let us pray we are all able to pay for it, are able to drink it and also able to hold it. 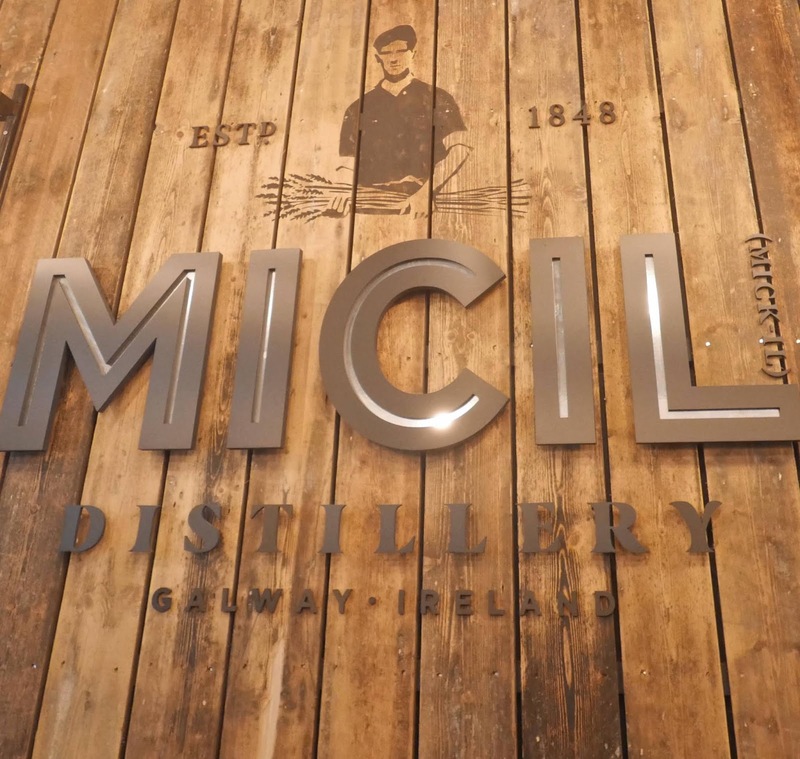 Read more about the Micil Distillery here.